St. Augustine Beach vacation rentals provide economical accommodations for Florida visitors wishing to tour the St. Augustine area but wanting to do so from a beach location. Families and business travelers alike will appreciate the spacious and homey feeling of the condos, houses and villas of St. Augustine Beach vacation rentals. Across the "Bridge of Lions" and only minutes from the "Old Town" and the centuries old stone fort, "Castillo De San Marcos", still guarding the entranceway to the city, your beach getaway can provide you with sun, surf and sand at your doorstep. As the largest city on Anastasia Island and adjacent to Anastasia State Park, St. Augustine Beach provides excellent opportunities for seaside exploration, ecotours, watersports and more, all from the vantage of your St. Augustine Beach vacation rentals. 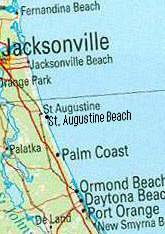 St Augustine Beach, Florida is located East of St Augustine on Anastasia Island. The entire area was first explored and settled by the Spanish soon after Ponce de Leon, the noted Spanish explorer, first set foot on these Florida sands in 1513. The shoreline area is well preserved with high sand dunes providing protection against erosion, enabling a well developed inner beach community of residences and commercial shopping areas. You can provide the entire family the opportunity for memorable historical adventures in a beach setting from St. Augustine Beach vacation rentals. Our St. Augustine Beach rentals page lists some of the attractions available in St. Augustine, Florida.